To use the program effectively, you can configure the application settings. If Show Quick Start on application launch is selected, the Quick Start window appears when Site Translator is launched. This window lets you perform the most important operations like assding files to translate, browsing the web, and opening the user guide for Site Translator. When adding folders for translation, you can choose for the contents of its subfolders to be translated as well. 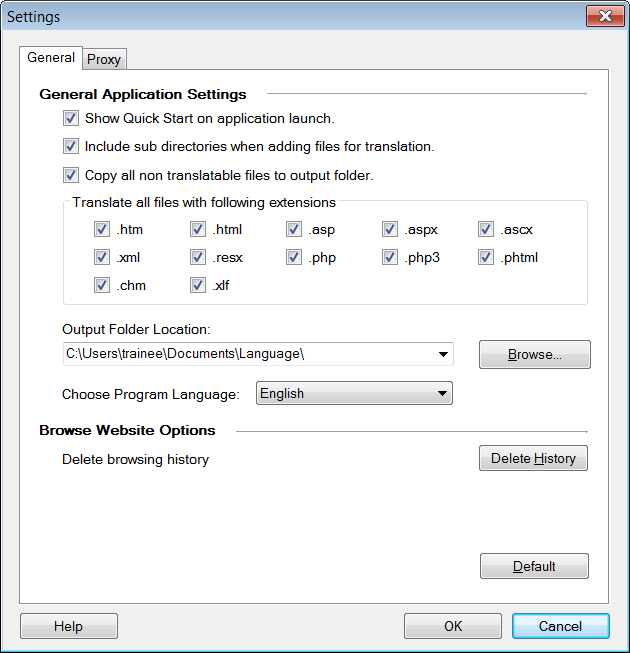 Enable the option Include sub directories when adding files for translation. If folder1 contains folder2 and folder3, the program converts the contents of all three folders. The translated files are saved in the newly created folders named folder1, folder2, and folder3. If there exist any files whose format is not supported for translation, you may still choose to copy it in the output folder as it is. These files include all image files, executable programs, Flash animations etc. Enable the option Copy all non-translatable files to the output folder. Check this option so that you do not have broken links in you translated pages. 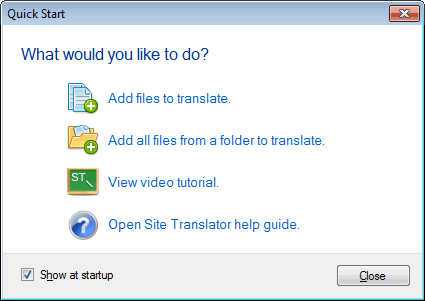 All the supported file formats for translation are listed in the section Translate all files with following extensions. Disable the file formats you do not want to be translated. For instance, if you disable the .xml option, the XML files are not translated. Choose the output folder location to save your translated files. The language in which the application interface is displayed can be changed using the Choose Program Language dropdown. When the language is changed, the text in the program is displayed in the selected language including Menus, Dialog boxes, Window titles, etc. Site Translator remembers the web pages that you have visited and translated. These pages are stored in the History of the program so that you can easily revisit them. However, you can delete the browsing history with the Delete History button. Deleting allows you to translate those pages again, after customizing the Translation Memory. If your computer uses a proxy to connect to the Internet, Site Translator will try to find the correct settings automatically. If auto-detection does not work, consult your network administrator for help in configuring the proxy settings. Choose Direct Connection from the drop down if your computer is not connected to the proxy server.